A new £450m contract to maintain the Typhoon aircraft in Lincolnshire will create 150 jobs and secure 350 more. 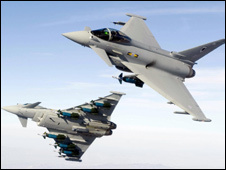 The Typhoon, the RAF's frontline fighter jet, has been based at RAF Coningsby since last October. The five-year contract will also see BAE Systems staff at Samlesbury and Warton in Lancashire maintain and develop the plane. The Typhoon programme already directly employs 16,000 people across the country. Junior defence minister Quentin Davies said the Ministry of Defence had signed a five-year contract with BAE Systems. "The programme is very important to the UK from both the military and industrial perspective," he said. "This contract will see BAE Systems taking a major role in ensuring the availability of the Typhoon fleet to meet its standing and operational commitments." Q&A: What makes the Eurofighter fly?